With the nineteenth century arrival of fur traders in the Mackenzie valley the lives of the Shuhtaot’ine or Mountain Dene changed dramatically. They became more closely associated with the fur trading posts of Tulita (Fort Norman) (map), Fort Good Hope, Fort Simpson and Fort Liard. From the late nineteenth century through to the 1950s the Mountain Dene would travel each year down from the Mackenzie Mountains to these trading posts in large mooseskin boats. It has been suggested these Dene adapted the basic design of the fur-trader’s York boat to produce a craft that suited the conditions of mountain rivers. Using the materials readily available to them the Mountain Dene typically made mooseskin boats measuring 14 metres (46 feet). They were constructed with a spruce wood frame and a covering of raw moose hides sewn together with sinew. These large boats were made early each summer high in the mountains at the Dene camps. The boats would then transport people, dogs, meat, furs and other goods down the fast-flowing mountain rivers to the Mackenzie then on to the trading posts. Designed as temporary craft only, the boats were dismantled after their journey. The moose hides were tanned and used for clothing and other items while the wooden frames were abandoned. By the 1950s the mooseskin boat had virtually disappeared from the material culture of the Mountain Dene. 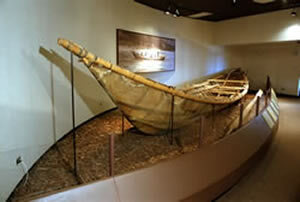 In the spring of 1981, the Native Communications Society of the Northwest Territories, the Prince of Wales Northern Heritage Centre, the Department of Information of the Government of the Northwest Territories, and the National Film Board of Canada, combined resources to undertake a project to recreate and preserve a mooseskin boat – a unique cultural feature of the Northwest Territories. Elders from Tulita (Fort Norman) and Deline (Fort Franklin) who had retained the necessary knowledge and skills agreed to build a boat. The activities surrounding life in the bush camp where the boat was built, the actual construction of the boat and its journey from the headwaters of the Keele River to Fort Norman were all recorded on film. In return for its contributions to the project, the Northern Heritage Centre received the finished boat for its permanent collection. After a year-long treatment with fungicides and preservatives, the boat was brought from its storage place to the Northern Heritage Centre where it is now on display.